One of the most disappointing feelings in photography is when you come home, load your pictures onto your computer, and realize that the photographs you thought were going to be so good are actually blurry. There are four basic causes for blurry photos, and there are ways you can correct for these causes in the future. Camera Movement--No one can hold a camera perfectly still, so camera movement can cause motion blur in an image. To solve this, you can use a tripod, a lens with image stabilization (IS), or adjust your aperture/ISO to get a fast shutter speed. The faster the shutter speed, sharper you image will be. The best solution for most photographic situations is a tripod. I admit, though, that sometimes tripods aren't practical, so lenses with good IS can be a big advantage. Beware, though, raising your ISO may give you noisier images. And even with IS lenses, you can have blurry photographs if your shutter speed is too slow or your subject moves. Subject Movement--A moving subject will also cause motion blur, but here neither a tripod or IS will help you. You can do one two things: adjust aperture or ISO to get a faster shutter speed, or try panning the camera with your subject as it moves. If you do it right, you may be able to get the subject relatively sharp, and the motion blur will occur with the stationary objects. Improper Focus--Your camera likely has many focusing points throughout the frame. On consumer grade SLRs, they are often bunched around the center of the frame. Your camera can automatically determine which focus points to use, but it doesn't always pick the ones you want, especially if you want to focus behind objects in the foreground. You can manually choose which focus point to use to ensure you have proper focus. You can lock your focus by pushing the shutter down half way, and while holding it down half-way, recompose and shoot. Lens Softness--All lenses have weaknesses, but some are more pronounced than others. Some cheaper lenses are somewhat soft in their focus when shooting "wide open"--that is, at the widest aperture or smallest f/stop. Try changing the f/stop to f/8 and see if your pictures are sharper. Of course, stopping down to f/8 will slow your shutter speeds, so you may need to use a tripod when trying this. 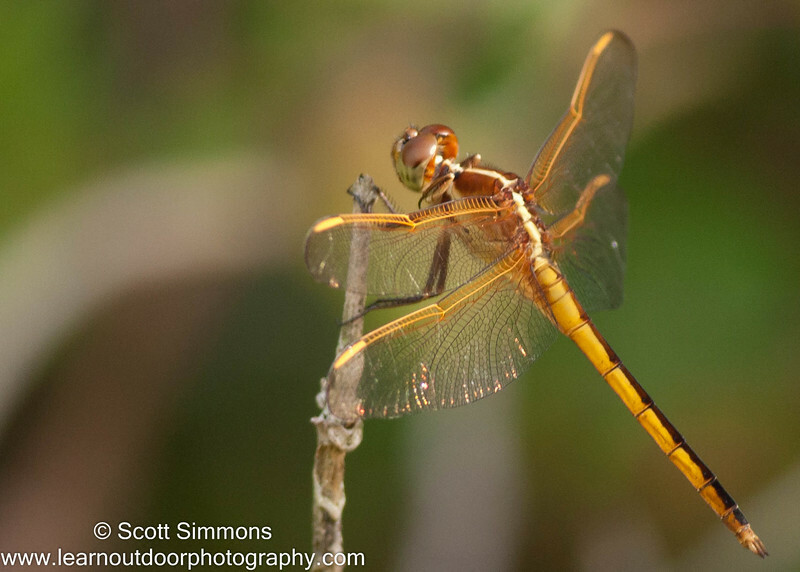 The above dragonfly picture illustrates the challenge of getting a sharp image. I was hand-holding my camera with a 400mm lens. In order to get a sharp image, I wanted a shutter speed of 1/400sec. To do this, I had to set my ISO to 640. There's a fancy trick to getting a sharp image in this kind of situation--take LOTS of pictures. wow. the detail in your sample shot is AMAZING. beautiful! Will try the f-stop trick. Very nice shot, BTW. Thanks, Jeff. Let me know if it doesn't work.